Basic single-panel cubed sphere Coordinates Multiblock coordinate system for single block of solid cubed sphere. 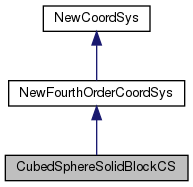 The CubedSphereSolidBlockCS class implements the NewFourthOrderCoordSys class for solid cubed sphere block. Referenced by getR0(), and setR0(). Referenced by getR1(), and setR1().